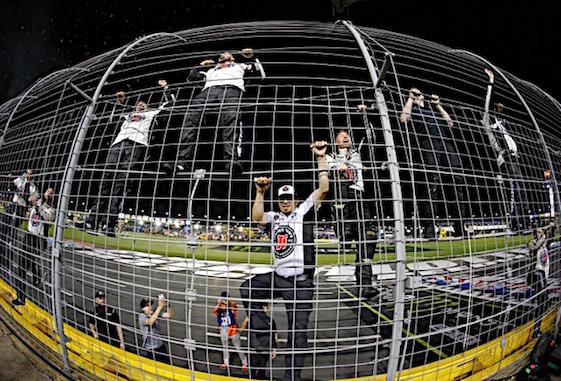 Kevin Harvick’s season of success rolled on Saturday night as he won the Monster Energy NASCAR All-Star Race at Charlotte Motor Speedway. Harvick, who has won five times in Cup points races in 2018, won Saturday’s exhibition even by taking control at the end of the 20-lap third stage. He won by beating Daniel Suarez to the checkered flag in overtime. With lane choice on the final restart, Harvick picked the top lane in front of eventual third-place finisher Joey Logano and it paid off. “I thought on that last restart that my best opportunity was Logano,” Harvick acknowledged. “He’s one of the best on the restarts. I knew he would work with me as good as possible, because that’s just the way that most of us do it from Ford. We were able to just stay even through (Turns) 1 and 2, and I really thought once we got to the backstretch we could clear him. Harvick picked up his second victory in the All-Star Race, the first won coming in 2007. The winner of the previous two Cup points races, at Dover and Kansas, claimed the $1-million prize that goes to the winner. Harvick crossed the finish line .325 seconds ahead of Suarez, who came close to clearing Harvick off the second corner after the final restart but didn’t have enough room to slide up in front of the No. 4. Denny Hamlin was fourth, followed by Chase Elliott, who earned the last spot in the 21-car main event via the Fan Vote. Jimmy Johnson, Kyle Larson, AJ Allmendinger, Kyle Busch and Kasey Kahne completed the top 10. Kahne rallied from four laps down after contact with the frontstretch wall on Lap 56. Suarez got a push from Hamlin on the final restart, but the Joe Gibbs Racing teammates didn’t stay connected as long as Harvick and Logano did. “The 11 (Hamlin) was doing a very good job as much as he could to push me,” Suarez said. “For whatever reason, he just disconnected a little bit, and I couldn’t keep the run with the 4 (Harvick) and the 22 (Logano). A six-car wreck that started near the apex of Turns 3 and 4 on Lap 75 – during the first attempt at overtime at the end of Stage 3 – eliminated Martin Truex Jr. and Brad Keselowski, both of whom led laps in the event. Truex entered the corner four-wide with Ricky Stenhouse Jr. below him, Clint Bowyer to his outside at Kurt Busch at the top of the track. Contact with Stenhouse’s Ford sent Truex’s Toyota up the track into Bowyer’s Ford, trapping Busch against the outside wall. Kyle Busch’s Camry also sustained damage in the wreck. “We had a really strong race car and felt like we maybe had a shot to win it,” Truex said. “Just four-wide going into (Turn) 3 there, and we all just ran out of room. The 17 (Stenhouse), I had him squeezed down so low, I just don’t know that he could hold it down there. (4) Kevin Harvick, Ford, 93. (19) Daniel Suarez, Toyota, 93. (10) Joey Logano, Ford, 93. (14) Denny Hamlin, Toyota, 93. (21) Chase Elliott, Chevrolet, 93. (11) Jimmie Johnson, Chevrolet, 93. (16) Kyle Larson, Chevrolet, 93. (20) AJ Allmendinger, Chevrolet, 93. (7) Kyle Busch, Toyota, 93. (17) Kasey Kahne, Chevrolet, 93. (2) Ricky Stenhouse Jr., Ford, 93. (9) Austin Dillon, Chevrolet, 93. (12) Jamie McMurray, Chevrolet, 93. (1) Matt Kenseth, Ford, 93. (6) Ryan Blaney, Ford, 93. (13) Ryan Newman, Chevrolet, 93. (5) Martin Truex Jr., Toyota, Accident, 75. (15) Kurt Busch, Ford, Accident, 74. (3) Clint Bowyer, Ford, Accident, 74. (8) Brad Keselowski, Ford, Accident, 74. (18) Alex Bowman, Chevrolet, Accident, 68. Average Speed of Race Winner: 84.688 mph. Time of Race: 1 Hrs, 38 Mins, 50 Secs. Margin of Victory: 0.325 Seconds. Caution Flags: 8 for 17 laps. Lead Changes: 12 among 7 drivers. Lap Leaders: R. Stenhouse Jr. 1-5; K. Harvick 6-30; M. Truex Jr. 31; Kyle Busch 32-50; B. Keselowski 51; M. Truex Jr. 52; B. Keselowski 53-54; M. Truex Jr. 55-69; K. Larson 70-74; D. Hamlin 75-81; K. Larson 82; K. Harvick 83-93. Leaders Summary (Driver, Times Lead, Laps Led): K. Harvick 2 times for 36 laps; Kyle Busch 1 time for 19 laps; M. Truex Jr. 3 times for 17 laps; D. Hamlin 1 time for 7 laps; K. Larson 2 times for 6 laps; R. Stenhouse Jr. 1 time for 5 laps; B. Keselowski 2 times for 3 laps.